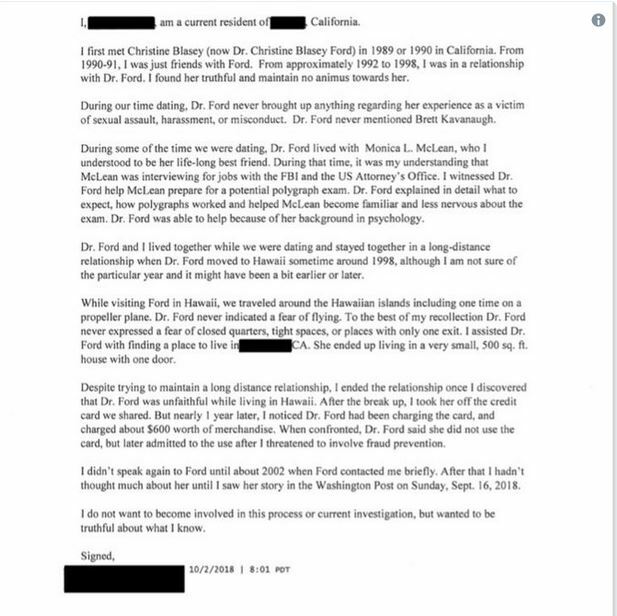 From the Federalist comes this potential bombshell, in a sworn statement provided to the Senate Judiciary Committee, a man who claims to be an ex-boyfriend of Christine Blasey Ford says that he personally witnessed Dr. Ford coach a friend on how to take a polygraph exam. If this is true, this could be trouble for Dr. Ford. Ford claimed during her testimony last Thursday that she had not ever coached or prepped anyone prior to the administering of a polygraph examination. Did she perjure herself? Sen. Chuck Grassley (R-Iowa), who chairs the Senate Judiciary Committee, sent the attorney’s of Dr. Ford a letter requesting the all polygraph-related documents and media to the Senate for review, that they have previously not provided. The troubling allegations about Ford’s polygraph history and potentially false testimony were revealed Tuesday in a letter from Sen. Chuck Grassley (R-Iowa), who chairs the Senate Judiciary Committee, to attorneys for Ford. Ford and her attorneys have thus far refused to provide all polygraph-related documents and media to the Senate for review. As reported at the Daily Caller, an alleged ex-boyfriend of Dr. Christine Blasey Ford came forward on Tuesday and said that she had once coached her longtime friend on how to take a polygraph test. See the letter below. The individual also went on to state that he never witnessed that Dr. Ford was afraid of small spaces. This case further becomes a she said, they said case. There is not one witness who has come forward to corroborate Dr. Ford’s story, not even the individuals that she claimed were there. This also includes Ford’s friend. In fact she states she never met Brett Kavanaugh.